Greece will ask its creditors for two more years (until 2016) to implement the austerity measures agreed with the Troika, The Financial Times reported citing a document obtained by the newspaper. Prime Minister Antonis Samaras will discuss the matter with French President Francois Hollande and German Chancellor Angela Merkel, whom he is supposed to meet next week. Samaras will defend his request with the deep recession in Greece, his chief economic adviser told the FT. The European Union is on vacation but hardly anyone could relax in good conscience given the news coming from the eurozone. While lately the attention is focused on Spain and Italy, Greece is still ticking like a time bomb in the euro periphery. Some say we could expect a "Boom!" in October when Greece's international creditors will decide whether to assign the next tranche of its bailout. Others say the bomb would explode within 6 to 18 months when Greece would still be forced to leave the eurozone. The news from Greece no longer sound intriguing to the broader public - not because they are not bad but because they have been the same for two years. The country's economy continues to shrink - according to the Greek statistical authority data of 13 August, in the second quarter of 2012 the Greek economy shrank by 6.2% compared to the same period last year. In the spring, the European Commission has forecast an economic contraction of 4.7% in Greece, which proved to be a too optimistic forecast. Unemployment has surpassed 23 percent in May, reaching a record of 55% among the young people between 15 and 24. At this stage it appears that the country will continue to spin in the vicious circle of prolonged recession, deepened by the budget savings, slow pace of reforms and investor mistrust. Greece has made a significant improvement in its fiscal indicators - according to the Greek central bank, the government's cash deficit fell to 7.2 billion euros in first seven months of the year compared to 15 billion euros a year earlier. According to Eurostat, in early 2012, the Greek debt has decreased to 132.4% of GDP from 165.3 percent in the end of last year. However, this result can be explained with the debt restructuring deal, and the media already suspected that a new restructuring might be needed. Without economic growth it will be increasingly difficult for the country to pursue fiscal consolidation and reduce its huge debt to a level of 120% of GDP, which is considered sustainable and is stipulated in the bailout`s terms. However, the Greek authorities keep not meeting their commitments to the creditors in a sufficiently satisfactory manner. The lag in implementation of the second rescue programme has gained dramatic proportions as a result of the parliamentary elections in April and again in June. As a result, the EU and the IMF suspended the next tranche of the second Greek loan, scheduled for June, and a mission of the Troika (the European Commission, the European Central Bank and the IMF) arrived in Athens. The experts left in early August but said they would postpone their "verdict" until October rather than September as originally planned. If the assessment is favourable, Greece would receive 31 billion euros of the loan totalling 130 billion euros. Troika experts will arrive in Athens in September and will remain there throughout the month in order to report to the Eurogroup meeting on 8 October, The Wall Street Journal reported, citing a European official. For several months senior EU and IMF officials have kept saying that they had no clue about the real situation in Greece and it would take time to form an opinion. The battle is to make spending cuts amounting to 11.5 billion euros over the next two years. This includes cutting 40,000 jobs in the public sector. Greece has pledged to cut 150,000 public employees by 2015, initially placing them in the so called labour pool at reduced pay rate and subsequent lay off. In reality, however, almost no action has been taken in this direction which can be easily explained with the elections in April and June. Athens is desperate for money which it can only get under the loan from the EU and the IMF, and any delay is a bad news for the Greek government. By August 20 Greece must pay back to a loan the ECB worth 3.1 billion euros. 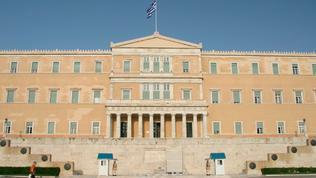 To get the money the country scheduled an auction for 14 August for the sale of short-term debt of 3.125 billion euros. But such manoeuvres cannot resolve major financial problems of the country which is entirely dependent on its international creditors. And they already look tired and at times outraged by the Greek inertia. This is particularly evident in Germany where it is increasingly discussed both a Greek exit from the euro and suspension of payments on the loan until there are no concrete results. Greek Prime Minister Antonis Samaras is entering crucial two weeks of his premiership, the Greek newspaper Ekathimerini wrote. According to it, by August 20 Samaras and his coalition partners - Evangelos Venizelos (PASOK) and Fotis Kouvelis (Democratic Left) - must reach an agreement on concrete measures for budget cuts of 11.5 billion euros in the next two years. With this list Samaras will go first to Luxembourg (22 August) for a meeting with Prime Minister and Eurogroup leader Jean-Claude Juncker, and then to Berlin (24 August) to meet Angela Merkel, the German Chancellor. The final decision on whether Greece will receive the next tranche of the loan will be made in October.